Participatory three-dimensional modelling (P3DM) is a participatory mapping method integrating indigenous spatial knowledge with data on elevation of the land and depth of the sea to produce stand-alone, scaled and geo-referenced 3D models. Essentially based on recollections from memory, land use and cover and other features are depicted by informants on the model by using push pins for points, yarns for lines and paints for polygons. On completion, a scaled and geo-referenced grid is applied to facilitate data extraction or importation. Data depicted on the model are extracted, digitised and plotted. On completion of the mapping exercise, the model remains with the community. P3DM has been conceived as a method for bringing the potential of GIS closer to rural communities and for bridging the gap that exists between geographic information technologies and capacities found among marginalised and isolated communities who are frequently dependent on natural resources. 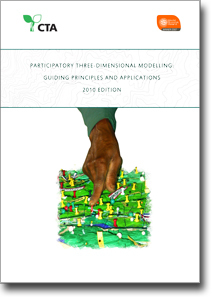 This handbook is intended to assist activists, researchers and practitioners of participatory learning and action (PLA) and GIS in bringing the power of GIS to the grassroots level through the use of P3DM. It provides hands-on guidelines on how to organise and implement a P3DM exercise. In addition it includes insights on adult learning and spatial cognition, on the history of relief models and on the use of the method around the world. On 5 November 2007, P3DM was granted the World Summit Award 2007 in the category of e-culture. P3DM was considered to be one of the 40 best practice examples of quality e-content in the world.